A non-fiction book, ideal for intermediate and more confident learners of English looking to improve and practise their English. 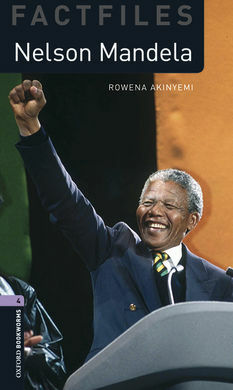 The book is filled with useful vocabulary that is carefully graded and easy to understand, it also comes with audio, so that you can listen at the same time as reading.In 1918 in the peaceful province of Transkei, South Africa, the Mandela family gave their new baby son the name Rolihlahla - 'troublemaker'. But the young boy's early years were happy ones, and he grew up to be a good student and an enthusiastic sportsman.Who could imagine then what was waiting for Nelson Mandela - the tireless struggle for human rights, the long years in prison, the happiness and sadness of family life, and one day the title of President of South Africa.